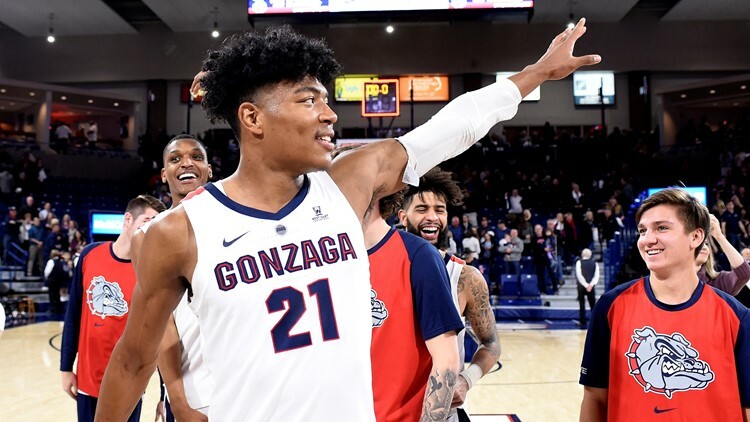 Rui Hachimura's short jumper with half a second left lifted top-ranked Gonzaga to an 81-79 win over in-state rival Washington on Wednesday night. SPOKANE, Wash. (AP) - Rui Hachimura's short jumper with half a second left lifted top-ranked Gonzaga to an 81-79 win over in-state rival Washington on Wednesday night. Washington missed a halfcourt shot as the final buzzer sounded. Jaylen Nowell scored 26 for Washington (6-3), which was in the preseason Top 25 before losing at No. 8 Auburn. Washington's zone defense slowed down the high-scoring Bulldogs. They were held well below their season average of 98 points per game, which ranked second in the nation. Hachimura had 18 points as Gonzaga took a 40-30 halftime lead. Washington opened the second half with a 12-2 run, and Jaylen Nowell's 3-pointer tied the score at 42. Nowell followed with another 3 for a 45-42 lead, as Gonzaga made just one of its first 11 shots in the second. The teams traded a flurry of baskets, and a pair by Brandon Clarke gave Gonzaga a 65-58 lead. Nowell's basket cut it to 79-75 with a minute left, and Matisse Thybulle's bucket trimmed the deficit to two. Nowell went to the free throw line with 9.4 seconds left and tied the score at 79. Washington: The Huskies held their previous six opponents under 70 points. ... Thybulle was the only player in the nation averaging at least 2.5 blocks and 2.8 steals per game. ... Noah Dickerson averaged 20 points in his previous four games. ... The Huskies were averaging seven blocks per game. Gonzaga: The Zags came in 35-18 against members of the Pac-12 under coach Mark Few. ... Gonzaga entered with four starters averaging in double figures, and two more scoring better than eight points per game.